Despite the fact that Sam and I grew up on opposite coasts and have had a lifelong love and comfort with the ocean, our boys up until this year were Colorado-born--more comfortable amongst the mountainous landscape and hiking than the sea. At the start of our year here, they were somewhat tentative in the surf. They have made great strides, though, and Jackson and Alex now both dive with ease under oncoming waves in a manner I never needed to become accustomed to in the warm, still bathwater of Miami Beach. 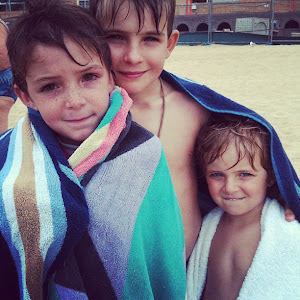 One of the best things the boys have participated in this year is the Wollongong City Surf Lifesaving Club. Kids as young as 5 years old learn about ocean safety and practice different events: Jackson and Alex both compete in flags (a quick beach race to grab a small section of hose, with one or two kids getting eliminated each round), sprint, sprint relay, and wade--and at Jackson's level they also do a swim as well as board races. We also signed them up for the four competitions in the Sydney Water Carnival Series, where they had an opportunity to compete against a number of other surf clubs in the area. Between the Saturday carnivals, the Sunday Nippers training and the Friday board training, the boys slept well at night. Jackson, who at four years old told us he was 'focusing the blood in his brain' before riding a sheep at a rodeo, thrives on competition. At the start of the season, Jackson was playing catch up as he learned the technique of each event for the first time, but by last week's Nippers pointscore competition, he was 2nd in flags, 4th in boards, and 5th in the swim. With no extra fat on his bones (clearly taking after his father more than myself), he is not one to brave the cold water and he often says he makes sure to not do well enough in the wade to have to go again in the finals. Flags is his favorite event, and he has done as well as 2nd place within his club (when he doesn't miss the signal to start running). For months now they have had everpresent sand in their scalp and unlike Sam and me, don't seem to mind a little grit in their bedsheets. At the last Sunday session this morning, Alex's Under 8 group gathered around and gave him three cheers as a send-off, of course while I subtly wiped tears from under my sunglasses. Over the past couple of weeks, and with a little bit of gentle prodding, Alex has confided that he's feeling anxious and that what he will miss most about Australia is the ocean. Dear friends wisely gave the boys some worry dolls as a going away present, and Alex used one last night because he told me he worried about how his friends will do here without him. As we walked away from the surf club for the last time this morning, Alex held my hand and told me that he thought he'd be using the worry doll again tonight. Sweet boy; I know exactly how he's feeling. The expression on Alex's face in the last picture is priceless!!! What a gift you and Sam have been able to give them with your love of the water.